The word "hamartia" may sound strange, but it actually has a simple meaning - hamartia is simply the tragic flaw or fatal flaw of a character in literature or film. In the Lord of the Rings series of books, the ring is Frodo's fatal flaw. Although the character himself is mostly a very good person, the ring threatens to undo him the same way it did Gollum - by driving him mad with the power the ring's possession affords him. 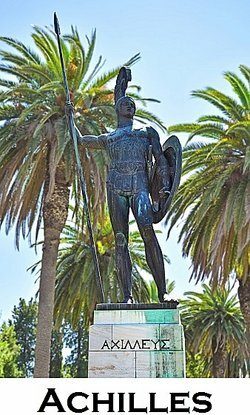 Achilles, the legendary hero of Greek mythology, was a nearly invulnerable warrior with one widely known fatal flaw: the heel that his mother held him by when she dipped him into the river Styx to make him strong. The heel ended up being his undoing. Today an "Achilles' heel" refers to anyone's fatal flaw or hamartia. The Bible character David's hamartia was his passion for a woman named Bathsheba. When King David decided to try and win her affections, he first moved her husband to the front lines in battle, ensuring that he would be killed. David's mistake led to the loss of his son and many blessings from God. Oedipus is a character in Greek myth whose instance of hamartia was simply not knowing his own origins. Oedipus killed his own father and then ended up marrying his mother, all because his identity was unknown to him. Samson is another Bible character whose fatal flaw was related to a woman. His love for Delilah - a wicked woman who was paid by the Philistines to find the source of his great strength. When he finally revealed that his strength was due to his long hair, Delilah's servant shaves his hair and his strength is taken away from him. Macbeth, the lead character of Shakespeare's famous play "Macbeth" has a fatal flaw that almost seems like a virtue. He suffers from the flaw of ambition, which leads directly to his becoming named the King of Scotland… but also to his death. When blind ambition leads him to kill innocent people, and ultimately die himself at the hands of MacDuff. Othello, another Shakespearean character, also possesses a fatal flaw. When Iago tells him lies, Othello goes into a jealous rage. It is his jealousy that drives him to murder Desdemona and, once he realizes her innocence, to commit suicide. Abraham, the father of the religions Christianity, Judaism, and Islam, had a fatal flaw that caused him to distrust God twice. The first time, fear caused him to lie and say his wife Sara was his sister, putting her in great danger. The second time he didn't believe God's promise of a son with his wife Sara due to Sara's age. It drove him to impregnate Hagar, Sara's handmaiden, resulting in the birth of Ishmael. In the Back to the Future film series, Marty McFly gets himself into trouble several times due to his fatal flaw - the inability to walk away when someone suggests that he is too afraid to follow through. His unwillingness to be labeled a "chicken" is an instance of hamartia. Lex Luthor's fatal flaw in the Superman universe is often said to be his enviousness of Superman. It is in fact this jealousy in the television series Smallville that drives him to become a villain. So, now you have lots of examples of hamartia and next time you watch a movie or read a book you can look for the tragic flaw in the characters you are watching. "Examples of Hamartia." YourDictionary, n.d. Web. 23 April 2019. <https://examples.yourdictionary.com/examples-of-hamartia.html>. The word "hamartia" may sound strange, but it actually has a simple meaning – hamartia is simply the tragic flaw or fatal flaw of a character in literature or film.